Very early on Thursday morning, I sprinted to my office in the law school at the National University of Ireland, Galway to watch the previous night’s US presidential debate on my computer. Despite my intention to avoid hearing how the debate had gone before I watched it, it was among the first news items on Irish radio when my alarm clock went off. And the analysis was unanimous. 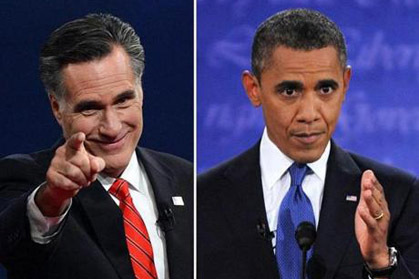 President Barack Obama had done poorly, while former Massachusetts Governor Mitt Romney had shone. I was not surprised. Most Irish on the other hand were shocked. The feeling in Ireland was that Romney was a poor debater. I knew otherwise. I write as a Democrat and a supporter of President Obama. I also write as a Massachusetts native and as someone who is well-acquainted with Governor Romney. Far more instructive as to Governor Romney’s abilities as a debater were the debates in the run-up to his election as governor of Massachusetts in 2002. Running as a Republican in perhaps the most left-leaning state in the country, he managed to pull off an extraordinary win against the Democratic nominee, Shannon O’Brien, an Irish-American from a well-established western Massachusetts political family who had already been elected to statewide office. I recall watching their last debate, in particular. As Shannon O’Brien self-destructed, Mitt Romney remained “on message” and articulated a crystal clear vision of how he would work to reform Massachusetts politics and government and to revitalize the local economy. Whatever Massachusettsvoters might have thought of him personally or of his party, they could not deny his competence because of how effectively he drove this attribute of his home with them in that final debate. He won the election by over 100,000 votes out of some two million cast. But as something of a skeptic – both when it comes to the influence of debates on the outcomes of elections and on the typically partisan reactions of political commentators to the performance of the candidates – I still turned on my computer with an open mind. It wasn’t long, however, before I found myself concurring with the pundits I had heard on the radio. Governor Romney was the clear winner. More to the point, this was the worst performance of any kind I have ever seen President Obama give on any stage. In total contrast to each and every other occasion on which I have heard the president speak in public, he was halting and hesitating. Even worse, he seemed ill-prepared and appeared disinterested, other than at the outset, when he apologized to his wife, Michelle, for having to share their twentieth wedding anniversary with in excess of forty million viewers across the US and around the globe. Governor Romney, on the other hand, was impressive from start to finish. He demonstrated an incredible grasp of detail, was unflinchingly self-assured, looked totally comfortable in his own skin and demonstrated an affability and a sense of humor, if not a likability, throughout the debate. His stories about and seemingly genuine sympathy for the ordinary Americans he and his wife, Ann, have met on the campaign trail undoubtedly helped to vitiate his reputation as a ruthless businessman unconcerned with the plight of those Americans who are struggling. It was reminiscent of former President Ronald Reagan. Governor Romneypresented himself to the American people as a very capable businessman, who loves his family and his country and who is uniquely well-qualified to kick-start an economic recovery in the US. It is unsurprising that Governor Romney’s inner circle and fellow Republicans were largely unreserved in expressing their glee in how the debate had gone afterward. President Obama’s political strategists and prominent Democrats sought to portray things quite differently. Their message was that the president had made a solid case for a second term; that Governor Romney did not do anything to make the American people like him personally; and that the debate would not change the Electoral College math that still favors their candidate. Yet the realities of what happened in the debate and the poll numbers indicating that 67% of viewers regarded Governor Romney as the victor fly in the face of their assertions. While it is also unsurprising that President Obama’s surrogates and supporters would try to spin things favorably for their candidate, it is extremely surprising that the president and some of the best political operatives in the business would allow themselves to be wrong-footed by Governor Romney. Before and after the debate, commentators have noted that Governor Romney dominated many of the debates during the Republican primary campaign. Indeed, President Obama’s own campaign manager, Jim Messina, termedGovernor Romney the winner of 19 of the 23 debates that were held during the long primary season. But those victories were recorded by a candidate who was always the front-runner and came against an unprecedentedly weak field. Nonetheless, by watching these debates, the president and his team had to know they weren’t facing a weak or inexperienced debater. So where does President Obama’s puzzling and inexcusably poor debate performance leave the race? The next couple of days will reveal whether it has moved the polls at all. The national polls are close; movement of two or three points would make this a statistical dead heat. President Obama’sadvisers are right though. The Electoral College math is what counts and it remains firmly on his side. And the president will surely be better in the next two debates, one of which is in the “Town Hall” format that he invariably does so well in. Regardless, President Obama must up his game. Strong and convincing debate showings aside there is no doubt about whose side Romney is on when it comes right down to it: those who have rather than those who have not. And in the upcoming debates, President Obamashouldn’t be afraid to repeat what Governor Romney was now infamously caught on camera saying at a fundraiser in May about those who don’t have. I can’t believe the president didn’t avail of the opportunity to remind viewers of it on Wednesday night. I’ve written and said it before and I’ll write and say it again. The 2012 US presidential election is vitally important to the future of the country of my birth. All going well and with God’s help, Ireland will be the country of my unborn child’s birth next month. But this election matters a lot to him or to her, too. Accordingly, I hope that Wednesday night will ultimately prove just an unfortunate low point in and nothing more than an historical footnote to President Barack Obama’s two-term presidency.